My Daughter Will Be Fine. How’s Yours? Like an inversion of Project Runway, we were “out,” but now we’re “in.” This week, we learned that Maya could move off the wait list into a spot for the neighborhood’s co-op preschool, which only takes 12 children in her age group. We were thrilled by this, obviously. The Co-op is close to our house and follows a Reggio-inspired curriculum, with a ton of fantastic literature, music and art. As ridiculous as this seems, for achievement-oriented parents, such ability to deliver the goods does feel, truthfully, like at least one important measure of how well we are doing. It’s a lot of pressure to put on parents when really terrific resources are scarce, and makes parenting into a far more competitive sport than it should be. When we were on the “outs,” I’ll admit to feeling a mild despair, along with the exhaustion of having to look around for a suitable alternative. We’d visited several other preschools over the past year, none to our liking. I had also been compiling a mental list of back-ups, including the local Waldorf school, and the Audubon Society’s preschool that I blogged about last week (which is lovely, but not that close to us). The lack of really strong preschool options stunned me, actually, as we began this search. And it’s a sad statement, really, of how we have not updated our educational systems to take full account of the research, which, for more than 20 years, has pointed unequivocally to preschool (and pre-preschool) learning and environment as the foundation for educational attainment for kids. The breadth of exposure matters. The research on bi-lingualism is stunning in this regard – even very young babies respond differently to familiar and unfamiliar sounds in the language of caregivers. Contrast that with the bad news on this front that I heard on the radio in just the past few days: DC high schools fail to graduate (on-time) 60 percent (!!) of students. And Marketplace, a show I normally loathe for its pro-market bias and triviality, ran a decent series this week on projects happening around the country, some financially doomed, to engage low-income children in learning earlier in order to close educational gaps. One of Canada’s many key innovations was his recognition that parenting classes – for parents of newborns – and access to high-quality preschool programming, would make kids far more ready to attend school, and would create the building blocks for success even among very low-income families with lower educational levels among the parents. Canada’s pioneering work has been successful in moving children to become academic successes. And he’s been at it for almost a decade. What’s really amazing is that his set of comprehensive tools, commonsense as it is, and his focus on the critical period of infancy and early childhood, remain largely disregarded in practice elsewhere in the country. There isn’t the money, nor is there the political commitment, to ensure that every child in America gets a learning-friendly environment at home, and that every child attends a quality preschool. In fact, the new budget fight being waged this week by Rep. Paul Ryan (R.-Wis.) would slash and burn supports for low-income families in order to pay for military spending, which is just sickening, really. According to Rep. Chris Van Hollen (D.-Md), a report by the Congressional Budget Office “found some 22 million households with children would lose aid to buy food, 300,000 children would be cut from school lunch programs, and 300,000 children would lose health insurance under the House plan.” To pay for bombers, literally. It’s like a bad joke on a bumper sticker. In short, we have a long fight ahead of us. But the costs of not doing this are astronomical, both as measured in the quality of children’s lives and in the social and economic price. Of course, if Maya had not gotten into our preferred school, there would have been another preschool, perhaps less convenient or ideal, but still high quality. And her home environment is nurturing in every way I know to make it, based on both my reading and on how my parents raised me. Put that with the quality of the food she eats and my persistent (albeit quirky) efforts to provide a healthy environment for her, and the advantages compound quickly. When you have a child, and must engage in the current, demanding contest for resources directly on their behalf, these sharp distinctions become far more real. And it’s far too easy to “get yours” and move on, being happy because this time, you happen to be on the list instead of off. But if all the more resource-rich parents merely wangle a way for their family, it will never create the urgency we need for change on a much more fundamental level. Simply put, it’s clear that we will never address the underlying causes of poverty unless we take far more seriously what we must do to provide a strong foundation for very young children, from infancy through kindergarten. We’re falling far short now, both on addressing poverty and on challenging families to do what they can to develop strong foundations in early childhood. Almost one-third of children 2 and under have television sets in their bedrooms. In their rooms! Which makes them more sedentary and emotionally stunted, studies show. And a shocking one-half of preschool-age children do not get a chance to be outside and play daily, meaning that some of that mental mapping is just … missing. Combine that with the chemicals and sugar in children’s foods and it’s easy to see where the obesity epidemic is coming from. To my larger point on early childhood: perhaps it’s hubris, but I can tell you right now, sitting here today, I firmly believe that Maya will be fine. (Or at least as “fine” as someone can be with nutjobs like us for parents.) But that doesn’t mean I’m ok letting all the other two-year-olds who didn’t make the list, or, more likely, weren’t on any list, just watch TV, inside, eating crap, instead of playing outside and attending a really good preschool that will make them into the kind of kids who will be good pals to Maya and help me cross the street in my old age. It’s as though the project we all started more than a hundred years ago – this task of publicly educating children – remains half-done. What we now know is that the period before kindergarten is just as critical, and may be even more critical, to a child’s success in life than the time after. So why isn’t there more urgency on this question? There should be a school like our Co-op on every other corner – so many that there aren’t any lists to get in. And if government funds are needed to make it happen, this modest investment would likely pay for itself many times over, in more productive and valuable workers, artists, and innovators (and fewer prison cells). Sure, most parents want the best for their children. But there’s a lot stacked against their ability to deliver nurturing and challenging opportunities. 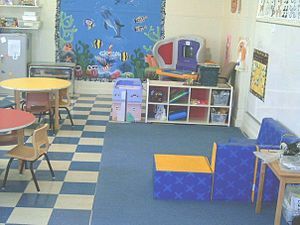 What I take away from our own relief at now, as of this week only, being on the “inside” of a good preschool for our daughter, is that what we really need is for parents – and the politicians they vote for – to want the best for every child.